Last week, I wrote a post in which I drew a comparison between Oswaldo Arcia and phenom George Springer. All things considered, the two are far from similar players, but this was strictly an offensive comparison. Even then, it wasn’t perfect, but it was something! Springer and Arcia had the two worst in-zone contact rates in baseball, yet carried two of highest isolated slugging percentages. They don’t hit the ball very often, but it’s worth it when they do. For that, they’re both interesting and worthy of a comparison. This time, there is no comparison. There couldn’t be. Because nobody was even remotely like Oswaldo Arcia in 3-0 counts last year. I found myself combing through some data of 3-0 counts on BaseballSavant late Wednesday night. Don’t ask me how I got there — these things just happen. I was combing through the data and a few things stood out. Like, for instance, Curtis Granderson led the MLB with 13 swings in a 3-0 count last year. Neat! Also, at the bottom of the leaderboard, was Mike Trout, who swung in a 3-0 count just one time in 44 at-bats. No, sadly, he didn’t go deep. It was a foul ball, and two pitches later he brought apparent-real-major-leaguer Efren Navarro home on a sac fly to left. But I digress. Granderson stood out, because he was at the top of the leaderboard. Trout, at the bottom. Thing is, I wanted a more interesting leaderboard. See, Granderson found himself in a ton of full counts last year — 53, to be exact — so we would expect his number of swings to be higher than most. The leaderboard I was more interested in was the one that looked at who swung most often in their 3-0 counts. Enter: Oswaldo Arcia. In total, Oswaldo Arcia swung 10 times in a 3-0 count. That raw number of swings, by itself, ranks third. But Granderson swung 13 times in 53 chances. Jose Bautista swung 11 times, but in 57 chances. Oswaldo Arcia swung in a 3-0 count 10 times, and he only found himself in 21 of them. That’s astounding. For context, the average hitter found himself in a 3-0 count 30 times last year, and swung four times. That’s a swing rate of 13%. Arcia was pushing 50. For a bit more context, Arcia’s swing rate is a full four standard deviations above the mean. Statistically speaking, it’s downright improbable. In a normally distributed sample, 95% of all data is expected to be within two standard deviations of the mean, and 99.7% should fall within three. This is a whole standard deviation higher than what’s already considered a statistical outlier. It should come as no surprise, then, that Arcia’s 2014 stands the test of time. Granted, the data only goes back to 2008, but in that time, it’s pretty much Arcia and the field. Dexter Fowler led the MLB in 2013 at 40%. In 2012, Wilin Rosario at 37%. The next year, Andre Ethier, at 37%. Year before that, Mike Napoli, 36%. You see where the league leader typically falls. Then you see where Oswaldo Arcia was. All those swings, and Arcia never once got a hit. He never even had an at-bat that ended in a hit. He only got on base 13 times, and four of them were intentional walks from the get-go. So, really, if you exclude the intentional walks, you could say that Arcia swung 10 times in 17 chances. Let that marinate for a second. Arcia’s on-base percentage, after a 3-0 count, was .619. Take away the intentional walks and it’s more like .529. The league average is .735. The league’s OPS, after a 3-0 count, is 1.210. Arcia’s OPS after a 3-0 count — since he never got a hit — was the same lowly .619. His OPS, for the season, was a respectable .752. Put another way: the only thing that happened when Oswaldo Arcia found himself in a 3-0 count was that he became a worse version of himself. Those are OK swings, but only without context considered. If you act on a 3-0 green light, the pitch better be good. Like, really good. The three outside of the strike zone are inexcusable. Same for the two bordering the strike zone. Only five of these swings are even close to defensible, and even then, it’s tough to argue with the results. We’ve got to see these swings. Let’s take a look at these swings. Maikel Cleto, evidently, had been wild that inning. They’d knocked in a couple of runs to make it a one-run game, with two outs, in the seventh inning. Twins really coulda used another baserunner. It was a good pitch, but you still question the swing, given the circumstances. Arcia flew out to left field two pitches later. Swung at ball four. This was one of Arcia’s worst swings, and he popped it up behind the plate. The at-bat ended in a walk and I’ve got nothing left to add here, so let’s go ahead and turn our attention behind the backstop. 27 people pictured. 25 looked up after Arcia made contact — even the two jabronis on their phones. RIP to those two dudes who didn’t look up, that later died from unrelated falling-piano accidents. Just a bad decision. Another ball four. Arcia realized his bad decision halfway through, but it was too late. 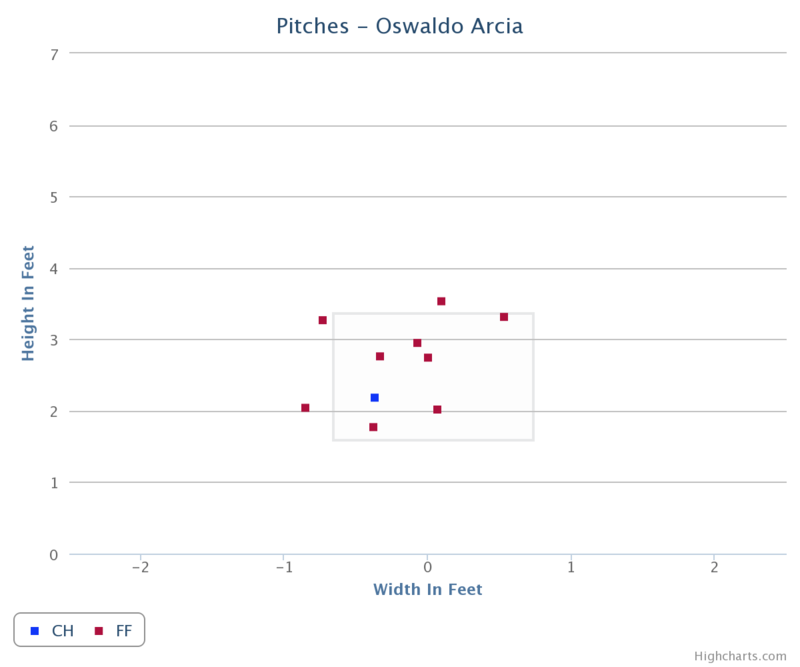 The count ended up getting worked full, and Arcia eventually drew a walk on a pitch that was almost certainly a strike. Sidenote: ‘sup with that back foot? Shouldn’t that ankle be broken? That ankle should definitely be broken. Actually a pretty good swing! We can let this one slide. Arcia got a good pitch to hit, in a reasonable situation, against normally-a-reliever Tom Wilhelmsen, who was starting on emergency notice. Just got over top of it. So, seems the broadcasters were praising Arcia for getting to 3-0. Seems he had been slumping lately, and the cause of that slump might have been over-aggressiveness. He had gotten to 3-0, which shows patience, but then went right back to the overaggression by hacking away at a questionable 3-0 pitch. Maybe ball four. This at-bat ended with a fly out to left field. Pretty good pitch! Pretty good lookin’ swing. Just got a bit under it. This is the pitch that was classified as a changeup, but PITCHf/x does that sometimes with Verlander’s fastball. This was just a slow fastball, mostly down the middle — the exact pitch one is looking for in a 3-0 count. Just didn’t take advantage. Remember that stat about how Oswaldo Arcia makes the least amount of in-zone contact in baseball? Funny how the perspective has changed since April. In April, the announcers expected Arcia to take. Now, it’s expected that he’ll swing. Bad, bad swing. Bad swing! Almost certainly ball four. The day after taking his best 3-0 cut of the year, Arcia took his worst. Chris Tillman almost looks like he’s upset with Arcia after the swing, but I think he was just shocked. Two outs, runners on first and third, early, in a 0-0 game. Twins had a chance to blow this one open. Bases would’ve been juiced had Arcia left the bat on his shoulder. Instead, he swung and gave Tillman the baseball equivalent of a cute little puppy on Christmas morning. And now, to wrap it all up, we have the swing that shows why Arcia hacks away the way he does. See that swing? That’s a strong swing. That swing keeps it real. He runs into a pitch with one of those swings, and he’s gonna be glad he swung. Problem is, he’s got to actually run into one first. We hoped you liked reading Oswaldo Arcia and the Relentless 3-0 Hack by August Fagerstrom! Interesting article. Does this have any affect on him next season, if so what? I assume coaches have been telling him that for years.